Want to know all about our world famous Tank Paintball battles here at Armourgeddon? Then read on! There's the short answer for those in a rush or just looking for the headlines followed by a much more in-depth step-by-step guide to what to expect for those looking for more information. If you are considering Armourgeddon for a corporate, stag, hen or group booking, take a read of what we have on offer in this article too. What is a Tank Paintball Battle? 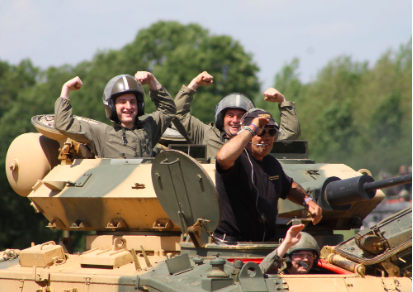 The short answer, is an adrenaline packed activity where you learn to drive a tank and then shoot giant paintballs at another tank in battle conditions! As part of a 3-man team, and with some guidance from your instructor, you will be transformed into an elite tank crew greasing the gears of paintball warfare! Each person learning how to drive the tank, load the breach and aim the paintball cannon fitted to the turret. First of all, you will drive with the hatch open and then you prepare for battle conditions and try driving with only a periscope to see through! When your nerves have settled a little, it’s time for target practice. Master the art of aiming the 40mm cannon fitted in the turret of the tank and then test your speed and accuracy in the loader’s position. After discussing some battle tactics, it's time to get the adrenalin pumping and make your crew proud, taking on the enemy in a Tank Paintball Battle! Who will drive? Who will load? Who will aim and who will fire? 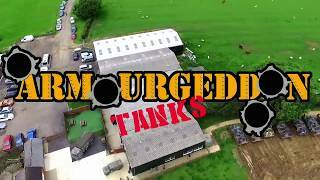 Far and away our most popular activity, Armourgeddon is the only location worldwide to run Tank Paintball Battles. This activity is suitable for individuals as well as groups. A maximum of 15 vehicles will operate at any one time. Extra Passengers. Maximum of 2 passengers (min age 8 yrs) subject to availability - £20pp. Please note that passengers do not get to drive the vehicles and they are in addition to the 3 full paying customers. All passengers also gain FREE museum entry! Availability - Saturdays, Sundays and selected Wednesdays from April to October. For availability on other days/months please telephone the office from 9am-5pm on 01858 880239. * The activity is based on the completion of a set criteria which can vary by crew and by person, therefore the timings are approximate. Some people just want the headline information above. Others want to know every last detail about the activity. If you are reading this, you are one of those who wants to know it all! You will fit in well here! Read on to get super excited about what we offer during a Tank Paintball Battle. So, what really happens in a Tank Paintball Battle? After a team tactics discussion, you will head into battle against another tank. Don’t worry if your numbers are not divisible by 3, we have plenty of ways to make any number in a group from 3-40 work for this activity. If you are coming on your own, we will create a crew for you. Our world-renowned, unique, Tank Paintball Battle experience gives you the chance to learn to control an FV432 tank around our ex-World War II bombing ground, which we have turned into two tank tracks. We will split your group into 3-man crews each with its own dedicated Instructor. On arrival, you will be issued with your uniform and a helmet to ensure 100% combat efficiency. Then you will be introduced to your crew, instructor and 'home' for the next couple of hours; one of our turreted FV432 tanks. After a safety briefing on the vehicle, you and your crew will take it in turns to drive around the World War II bombing range. After you have mastered the controls and have become used to heading full pelt into a dip, bouncing your crew around in their turret seats, and keeping the acceleration to come back up the other side, it’s time to drive in battle conditions. With the lid closed, your only viewpoint is through the telescope above your head. Looking through a screen just 10cm wide and 5cm tall gives a very different perspective on the world! Judging distance over the rugged terrain of our track takes a bit of practice, but our FV432s have seen much worse and will keep you upright. These machines are quite remarkable when it comes to a centre of gravity that keeps you the right way up! After each member of your crew has driven and become accustomed to the controls of your tank, it’s off for some shooting practice. Parked up opposite our static targets of a disused tank and a huge bulls-eye target, your instructor will explain how to manoeuvre the cannon into position, to charge and load and then to fire the giant paintballs. What is easy for some is impossible for others. What will be your strength? Will you be a driver? Will you be the quick-handed charge and loader with precision and attention to detail? Or will you have an eye for the target and be the sharpest shot on the track? Next, it’s time for your battle. Heading to the far side of the track, each tank will take up their starting position. From there, it’s a race to position one, at which point your fire crew will aim, load and fire their first cannon at the enemy tank. With one point for each direct hit, although speed is important, precision and timing are of equal focus. A second paintball is shot at the same position before they shout through the tank to ‘GO GO GO!’ and it’s on to position two. Getting into position first provides an advantage, as you are able to shoot at the enemy tank as they arrive at the checkpoint and start to ready themselves for their shots. If you can shoot and be gone before they are ready, their chances of a direct hit on you are significantly reduced. With 6 checkpoints in the battle, 12 shots will be fired at your enemy tank in total. With the winning crew being the one with the highest number of direct hits, bragging rights back at HQ for those with the best record will only be outlived by the smiles etched on your faces. The instructors, however, are very much focused on their season score so will certainly be very supportive and excited by direct hits!! This activity differs from the regular Tank Paintball Battle and Corporate tank Paintball Battles because in an extended battle, each crew will enter into three battles against the enemy tank enabling each member of the crew to take up each of the positions in a battle scenario; driver, loader and shooter. This means that battle is tripled in length- and of course provides additional options for bragging rights back at the office! If you are arranging a corporate activity or group activity, such as a stag or hen event, and are looking at Armourgeddon as your choice, then you have the option to add catering to your event. With options ranging from breakfast on arrival, through to finger buffets for lunch, on to full plated meal options, our catering partners are able to provide an option to suit your needs and any dietary requirements. We have areas where you can speak to the whole group and potentially hold discussions, but this would be in our barn area or within the museum so there are no facilities for interactive whiteboards or projectors!! If you are looking for a variety of activities in one day, we can also create a bespoke day to suit your group and budget, to include options for archery, air rifle shooting, clay pigeon shooting, quad bike safari, regular woodland paintball or even hovercraft driving. Armourgeddon is the only place worldwide that you can engage in a tank paintball battle. So, if you are looking for a truly unusual activity for a gift, for yourself, if you are organising a stag or hen party, or as a corporate or group activity, then you have found the right place! Simply call the office between 9 am and 5 pm Monday to Friday on 01858 880239 and we can discuss your needs and suggest an activity or day of activities to suit you.